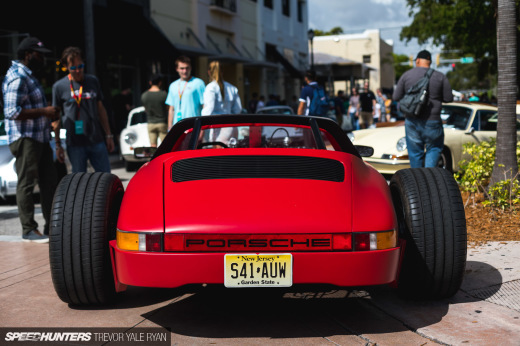 The Targa Trophy Triple Crown Rally consisted of three events this year. The first rally this year took place in Orange County, the second in San Diego, and finally this past weekend in Los Angeles. Due to the wildfires engulfing Southern California some roads on our original route had been closed so in the drivers meeting they announced to us we would be going another way. The destination was set for Santa Barbara with quite a rough route to arrive there. We were not just hitting the 101 Highway for this drive. We took a long route across the Los Padres National Forest and I am sure it would have been amazing if we only would of made it. Here is the Rogue Station Scion tC driven by Jasper Watts for the Targa Rally. This car is a Gumball 3000 veteran and one of the many cars entered by the clothing brand Rogue Status for the rally. AMG was a sponsor of the Targa Rally and they brought out several models for the Targa participants to test out before we departed to Santa Barbara. I opted to take a spin in the new SL63 AMG roadster. At a $135,000 price tag I must say it’s worth every penny. I found myself just flogging the car for the sheer purpose of listening to the most amazing exhaust note I have heard come out of a factory machine in sometime. 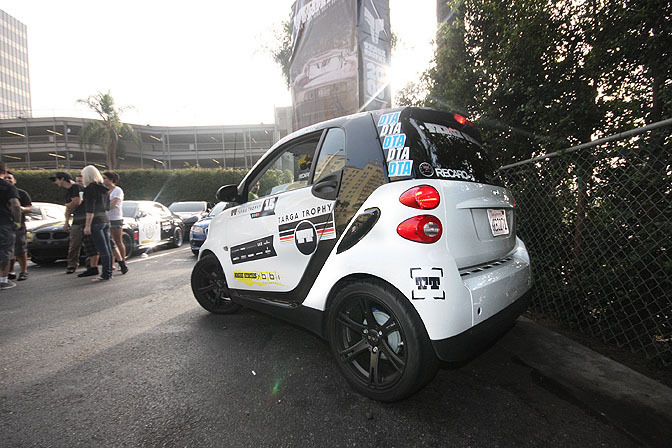 The guys over at BBI Autosport brought out this fierce Smart car on the Targa rally. Somehow they got pulled over on the rally with the cops claiming they were going almost 90mph through the mountains. The first car out was Fabryce from Global Motorsports Group (GMG Racing) in this gorgeous white GT2. This thing was one of the best looking machines on the rally. We left the Roosevelt Hotel probably 10th out of the gate and headed to Laurel Canyon that would bring us to the 101 Highway and out of Los Angeles. Sitting at the Laurel Canyon / Ventura Blvd. light we were snapping some photos of this red Lamborghini on the rally that we had pushed ahead with and found quite a surprise in the Toyota Prius next to it. That is Donald Faison from Scrubs who just happened to be coming down Laurel Canyon at the same time we were, how random is that? 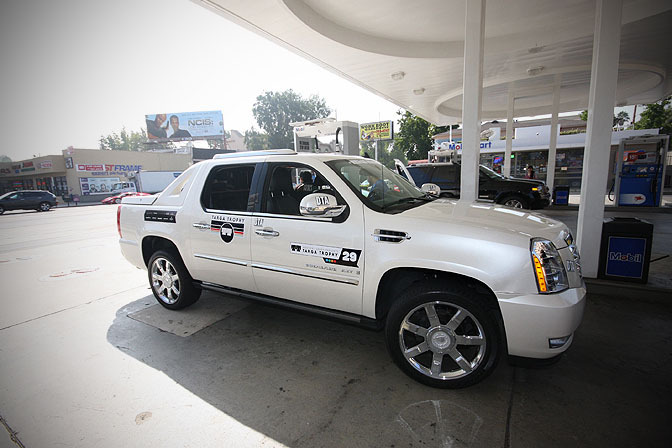 Just before getting on the 101 it occurred to us that we had not put gas in our Escalade. Being rally veterans on a rally that is judged on distance traveled within a set time we would of maybe fueled up before leaving but we didn’t. We got fueled up rather quickly and headed north again. Traveling north we made it quickly to Highway 5 trying to join back up with our group and past this Porsche from the rally and a motorcycle cruising north. Then we found out our group pulled off and we past them a few miles ago. Cruising around at 50mph this Audi came flying past us heading to Los Padres National Forest. We came off the highway and while traveling down the exit ramp our car completely shut off and died. It managed to roll itself into the middle of the intersection so we had to hop out and push it. We thought the problem might have been a blown fuse or something of that nature since the car would try and crank but we could get no power to the fuel pump. It ended up after a dealership warranty service that the battery completely failed. West Carter from Rogue Status hopped in our car for the trip and we ended up putting him to work. We had to remove the vinyl from the vehicle quickly before Onstar arrived with our ride to a dealership in Valencia. We were able to watch the whole rally pass us by as we sat on the side of the road. 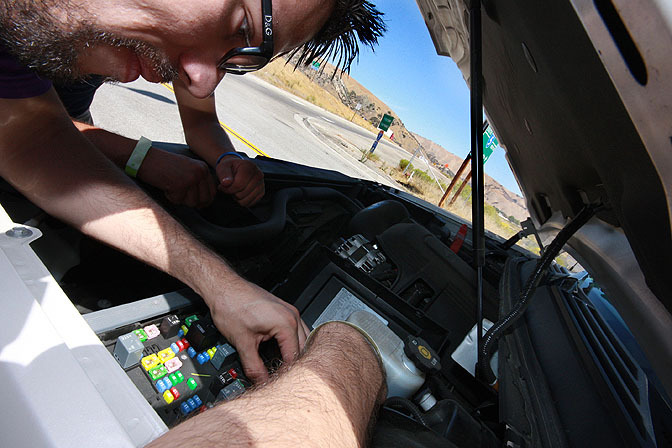 This is one of my favorite shots that Ricky captured as we waited in the heat for OnStar to arrive. 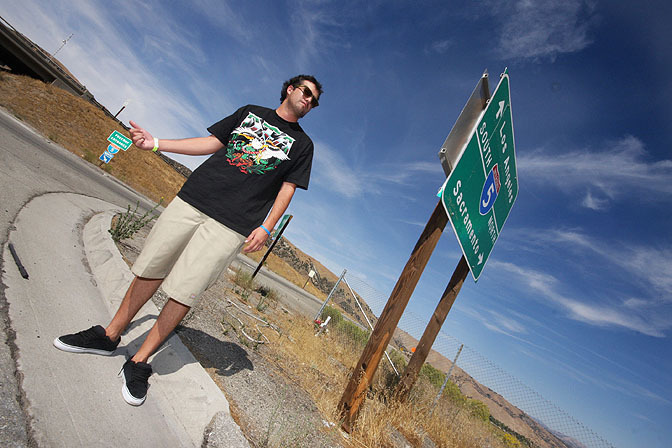 West gave up on us and resorted to hitchhiking at the Highway 5 entrance although no one offered to pick him up. Our photographer Ricky Cervantes had to ride in the car while it was on the tow truck since we had no room in the tow truck. This was a bad idea but he wanted to and opted to snap some photos while inside. With another rally in the books we failed to complete a second one. While making half of Gumball 3000 in May I surely figured we could manage to make it on a one day several hundred-mile trip. This wasn’t the case but there is always next year and many more rallies to try and conquer. On the bright side all we have left is room for improvement and we will gladly keep all of you Speedhunters posted on our adventures. Scrubs FTW best show ever! are you guys on the wrong side of the road passing that Porsche and motorcycle??? No we are in the HOV lane on the 170. 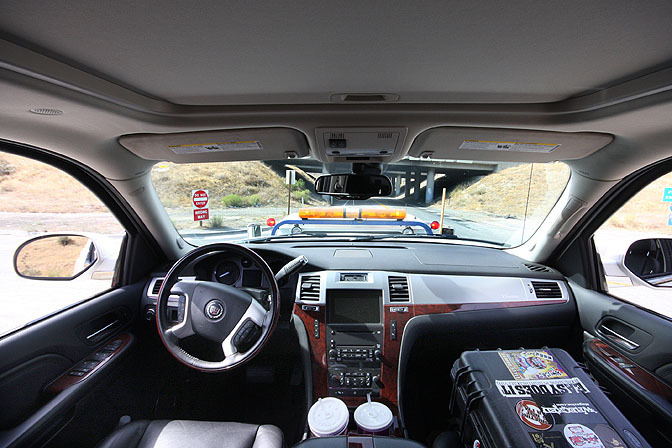 That is how HOV lanes work in California. You have 2 yellow lines and one white line, why, I have no idea. I so wish there were some cool road rallies I could participate in here in BC.